Its ultra low cut does not prevent it to be highly technical, technological and compressive. Its T3 size weighs only 14g and makes itself invisible when worn.Though in low cut, these compression socks wholly cushion the Achilles tendon. The new Pro Racing Socks V3 - even more airy, even more comfort! Comfortable fit and great breathability. Years of research & development and cutting edge technology packed into a racing sock, they have quickly become the must have foot accessory for any serious endurance athlete. 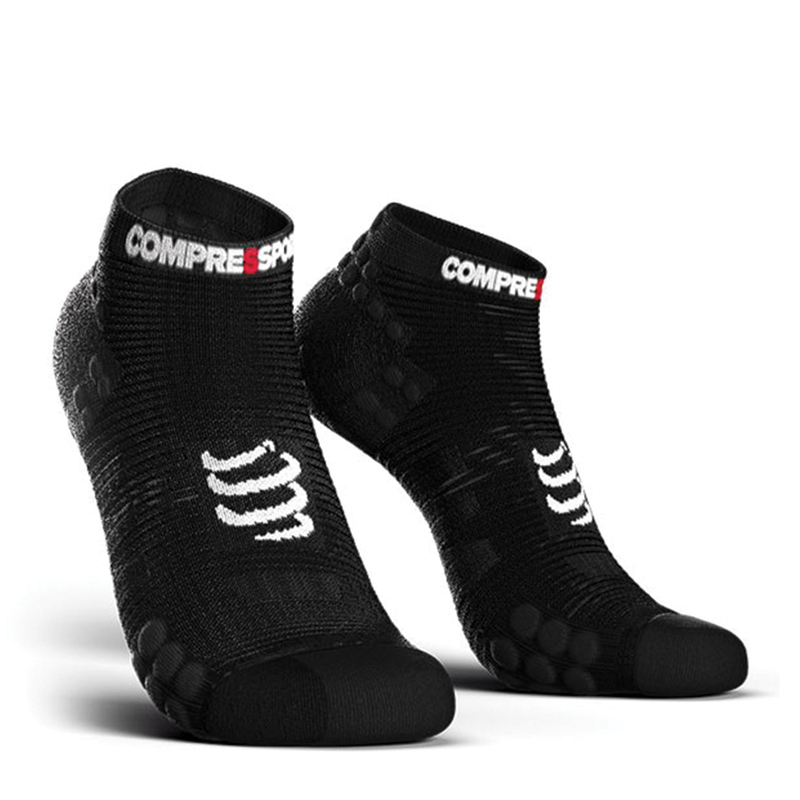 Worn every week-end around the globe by World champions, Pro athletes, age group athletes and week-end warriors, the COMPRESSPORT® ProRacing Socks V3.0 offer extreme comfort, improved blood circulation and biomechanical advantages. • Arch stim - Located in the arch of the foot, it also provides for venous return and recovery. • Ventilation stripe design - Air enters the 3D.dots which prevents the sole of the foot from overheating during effort. • Acu pressure - “The massaging acupressure” is designed to activate blood circulation by multipoint massaging of the sole area. • Malleoulus protect - For shock absorption, 3D.DOTS have been added to the interior of the malleolus. • Grip 3d.dot - The 3D.DOTS are multidirectional and ensure maximum grip in shoes thereby preventing feet from slipping during effort. • Shock absorber - The 360° compression dampens the “shock wave” effect on muscles, veins and joints. • Anatomically correct - Specially designed for right and left foot in order to adhere to the anatomy of the foot and maintain your performances.